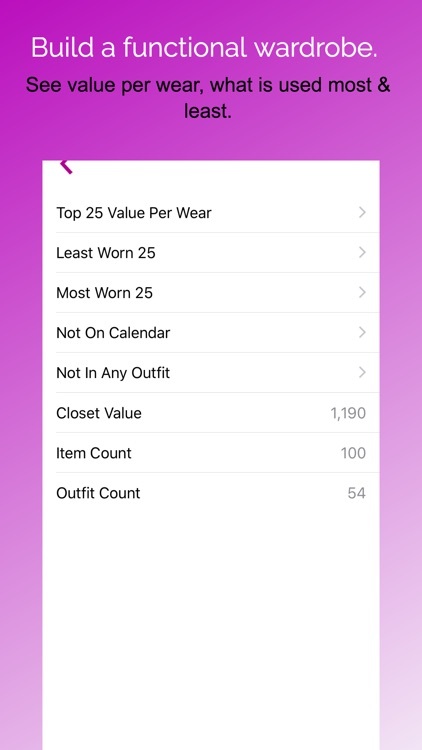 Pureple is #1 outfit planner and closet organizer app on iTunes. 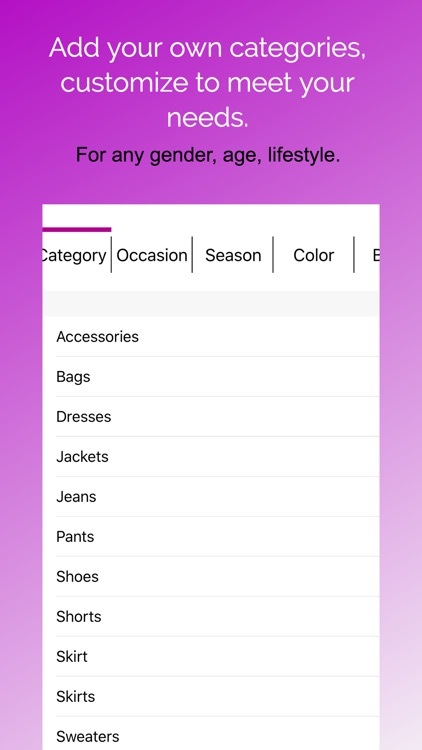 It's a fashion app that suggests you outfits from your own wardrobe. It's FREE with no catches. 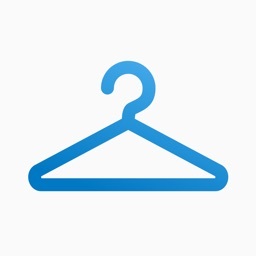 - Provides the easiest and fastest way to create your virtual closet by auto categorizing your items, providing ability to add from web directly and editing multiple items at a time. 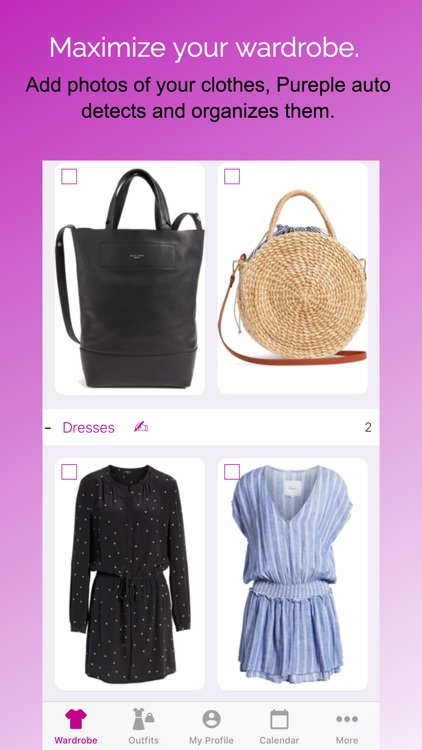 - As a virtual stylist, Pureple suggests you outfits from your own wardrobe by learning your style. - Perfect for capsule wardrobe planning. A closet full of clothes, yet nothing to wear. Sounds familiar? Ending up wearing same favorites over and over? Would like to save time and remove guesswork in the morning? - Access it anytime anywhere. - See what you have at a glance and wisely organized. 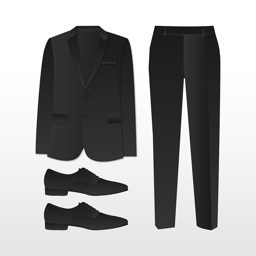 - Plan your outfits in advance, at your convenience. - See all your outfits containing a particular item, ask for outfit suggestions for an item. You can take photos, add items directly from web or our database. Pureple auto categorizes them for you. Organize your items by season, occasion, color, brand, size, location, availability, price, material, rating and more. Add your own categories. With powerful filtering capabilities, see exactly what you are looking for in seconds. Create your own lookbook, stylebook. While shopping, choose smart pieces that will integrate nicely into your wardrobe. Minimize impulse buys & duplicate purchases. 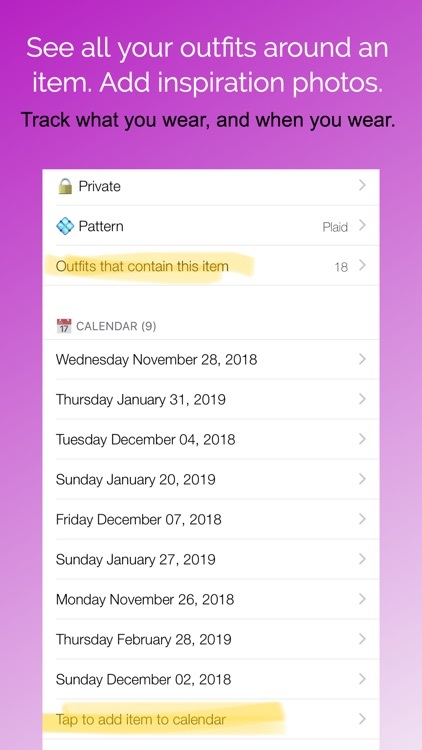 Keep track of when you wear an outfit or plan outfits with Pureple calendar. Share your ootd/lotd to social media. Discover new trends, get style inspiration from Pureple community. Pureple is for men and women, any age and lifestyle as it can be customized. Did we mention packing list, an awesome background eraser and crop functionality for your photos? 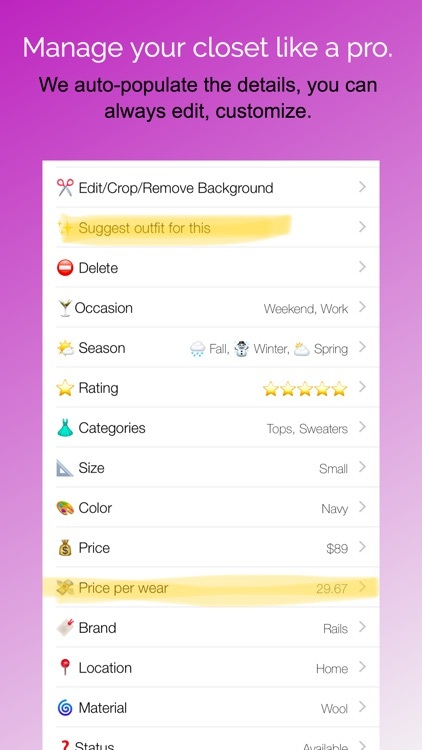 And outfit maker with zoom, rotate, arrange, edit support? Backup with the built-in iCloud/iTunes backup and restore tools to keep your data safe if something goes wrong with your device. - Using Pureple on multiple devices, allowing access to your wardrobe from multiple phones, iPad, iPhone, iPod etc. - Cloud backup. Your closet is backed up with iTunes/iCloud backups free of charge. With pro upgrade, it is also backed up on Cloud. - Statistics e.g. items with highest value per wear, most worn and least worn items. 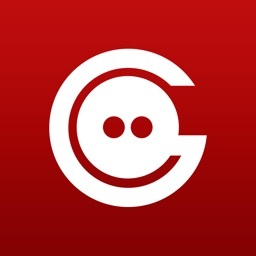 Pro version is subscription based for $1.99/month. 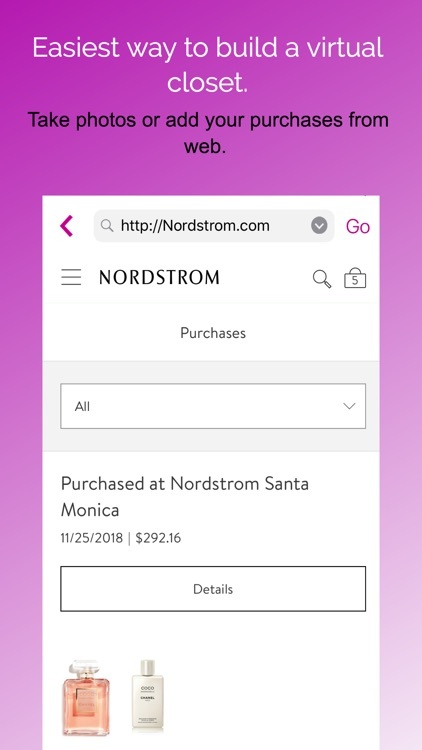 With only one-month's subscription for $1.99, you can copy your closet as many devices as you like and then cancel after a month. • Subscriptions may be managed by the user and auto-renewal may be turned off by going to the user's Account Settings after purchase. You can continue using Pureple as a free app after canceling. Two icons made by Freepik from www.flaticon.com. 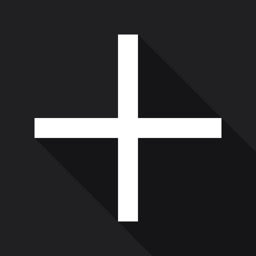 Flaticon is licensed by Creative Commons BY 3.0.